For two weeks every spring, Newhouse Assistant Professor Simon Perez heads back to the newsroom. And while the veteran, bilingual newsman could probably join or lead any news team in the country, Perez does what few do: he heads straight into the field, covering stories one-man-band style, just like his students. Simon Perez speaks into the camera while reporting in the San Francisco area. Before joining the faculty at Newhouse in the fall of 2011, Perez spent more than 10 years working for KPIX, the CBS station in San Francisco, which is the No. 6 market in the country. 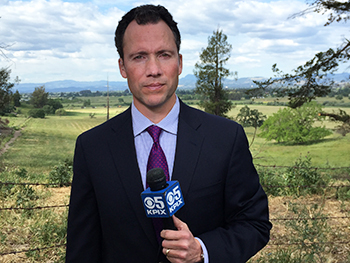 This is his third year at KPIX, where he spends two weeks each May working as a reporter. The unions in California require that he get paid, but when you factor in the cost of his plane ticket, hotel room and meals, Perez says he comes out about even. “What I get paid in experience, you can’t put a price tag on,” he says. Perez’s former bosses are still at the station. They said he could return any time. Perez goes to his old newsroom the Thursday before his first Monday shift to pick up his equipment. He spends the weekend “furiously” testing it out so he’s ready to report Monday morning. Then he’s assigned daily stories just like everyone else. 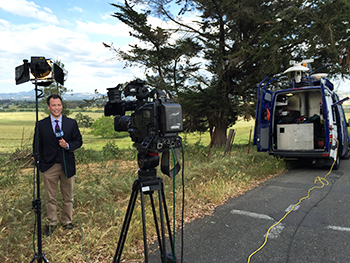 The field reporters at KPIX cover a large swath of the Bay Area, including San Francisco, San Jose and Oakland. Because the area is large and traffic is thick, reporters are assigned their own trucks and equipment. They are responsible for setting up and operating their cameras and microphones and then produce and edit their news stories from the back of the truck. Only when doing live shots are they assigned a camera person. The experience is very similar to what broadcast and digital journalism students have to do at Newhouse. A shot from farther away shows all the equipment needed to perform a live shot. Perez says students genuinely appreciate how he can recall examples from working in the field. Instead of relying on a textbook or hypothetical example, Perez—like many Newhouse professors with industry experience—can give a real, current example of how he handled a situation. Perez loves what he does—in the field and in the classroom. But as much as he loves being a reporter, returning to his roots has become about one thing only: teaching. All day, each day while working in San Francisco, Perez says he thought about how the experience would translate to the classroom: What could benefit students? What could students learn from? What did he not want to forget to bring back to Newhouse? In addition to his story notes, Perez also took teaching notes. And after each shift—including the double he was asked to work during sweeps—Perez sat down and wrote a blog post about that day’s experiences. His blog, www.simonperez.com/blog-1/, is loaded with stories and photos of how he approached his assignments and valuable takeaways that apply to reporters from rookies to pros. “I really put myself in the mindset of the students, of what it is that they might not know,” he says. Chris Tuohey is the chair of the broadcast and digital journalism program at the Newhouse School. He’s heard how much students appreciate Perez’s current experience. “They know particularly with Simon that they’re getting somebody that’s fresh from the front lines,” Tuohey says. Perez is one great example of the type of hands-on, professional experiences and expertise students have access to at Newhouse. In addition to providing memorable tales of forgetting to turn on the camera or sweet-talking his way into an interview, the annual newsroom experience always presents Perez with new learning opportunities, he says. At a party during his recent stint, one of his former bosses said “you wouldn’t believe this cover letter I got.” So he asked the news director for examples of good and bad letters he could bring back to show students. And while his notebooks returned to Syracuse heavier this spring, Perez did not. Between the stress of the job, irregular hours and lots of walking with heavy equipment, Perez says he lost seven pounds this year and nine in 2014.